Using a construction method that borrows heavily from traditional doll making, Richard W. James makes contemporary figurative sculptures that incorporate found objects as well as materials/processes that he associates with his rural upbringing. His work explores how the aggregate nature of personality and memory construction affects the sense of self, and by extension, interaction with the world around us. Richard grew up in rural Tennessee. He earned his MFA in ceramics from the University of Kansas in 2016 and was a 2016-17 long-term artist-in-residence at Arrowmont School of Arts and Crafts in Gatlinburg, Tennessee. 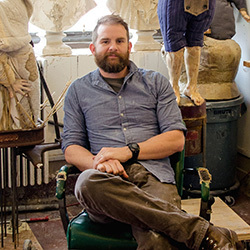 He has been a summer artist-in-residence at Zhenrutang in Jingdezhen, China, a special student in ceramics at Indiana University, and received his BFA from the University of Tennessee at Martin in 2001. Richard joins the Bray as the 2017 Speyer Fellow.